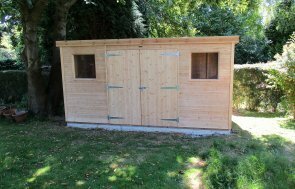 This 2.4 x 4.2m Superior Shed has been installed in our customer’s garden in Lower Shiplake, Oxfordshire to be used as both a small DIY workshop and a storage area. The left-hand section of this shed is 2.4 x 3.0m in size: it has a single door with a Georgian window and a set of two Georgian windows on the front side, with another set of two Georgian windows on the left gable end. Inside this partition, there is a workbench under the two windows at the front to allow the customer to work on his DIY projects on. The right-hand section is 2.4 x 1.2m in size, and it has a single door on the front with a single Georgian window in the right gable end, which will perfect for use as a small storage area. There is heavy duty felt on the roof, and the building has been painted in Sage, which is a colour from our Valtti colour range. Valtti is an opaque paint system that we apply in four layers to give the maximum protection to the timber underneath it. 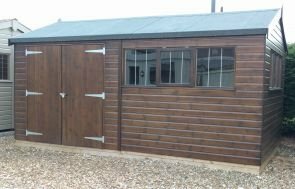 Other features on this shed, include black guttering along the front to protect the windows and doors from excess rainfall, and heavy duty flooring inside to allow the customer to keep heavy items inside that won’t damage the floor. 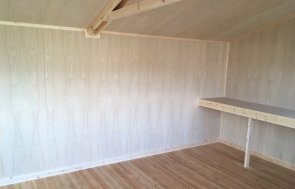 If you would like more information on our Garden Sheds at all, you can call us on 01760 444229, send us an online enquiry, or even use our Online Garden Building Planner Tool to configure your ideal building.